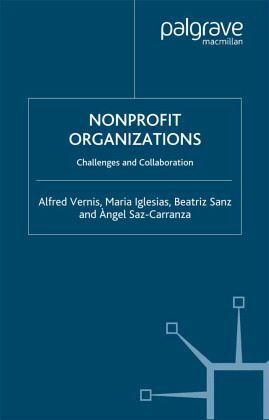 Management of nonprofit organizations is characterized by several distinctive aspects in relation to human resources, communications, strategic planning and the fallacy of using profitability as an indicator of success. This book examines the challenges facing nonprofit organizations, particularly with regard to collaboration, trust and innovation. ALFRED VERNIS is Associate Professor of Business Policy and Lecturer on Public Management at ESADE, Barcelona, Spain, and is a member of the Social Council at the Spanish multinational, INDITEX. His areas of expertise are public private collaborations and strategic management. MARIA IGLESIAS has worked for several non-profit organizations and has been a researcher of the first White Paper on the non-profit sector in Catalonia, Spain. She has also worked as a consultant to nonprofit organizations assessing in areas such as human resources, strategic and project management. BEATRIZ SANZ has worked for several international organizations and international NGOs. Her areas of expertise include the training of not-for-profit organizations and the design, appraisal, monitoring, management and evaluation of international co-operation, good governance, decentralized co-operation and capacity building programmes. ANGEL SAZ-CARRANZA has worked with several nonprofit and governmental institutions in Europe, Africa, Latin America and Asia in Humanitarian Aid and International Development. He has also worked as a management consultant to public and nonprofit organizations in the social field.